This is a Polish version of the Soviet soda vending machine, an amazing piece of technology. During Perestroika we got a glimpse of foreign television during the Japanese TV week. If I remember correctly they showed an hour or two of selected Japanese TV shows on one of the three state-run stations. As a curiosity they showed a snippet in which Japanese reporters try to use one of these machines. Equipped with some change, giggling they approached the machine. They put one of the coins into the slot and were surprised by the jet of water from the dispensing nozzle. In Japan one of them explained, the glass drops down from the machine and fills with ice. Then they noticed the communal glass (a paneled one from the previous post) and for a few minutes tried to figure out how to wash it. Then they notices the indentation to the right of the machine. They stuck the glass in there and after a few tries washed it with in the mechanism that shoots little jest of water from underneath. 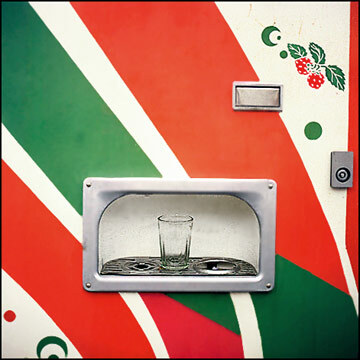 Another coin – soda went into the glass correctly prompting shouts of triumph. I don’t remember if they were brave enough to drink it. The prices were 1 kopek for plain seltzer and 3 kopeks for seltzer with a shot of syrup. Those with a sweet tooth liked to collect a few shots of syrup which was dispensed prior to the water (technically making it a post-mix machine) and then filling the glass completely. Unscrupulous machine maintainers liked to underdose the syrup helping them to steal some money. 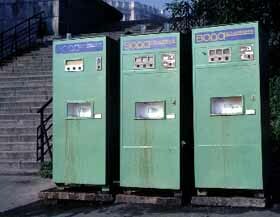 Another one of bright memories was when my father, a civil engineer, took me to his construction site which had one of these soda machines that did not require a kopek to operate – you could drink as much as you wanted. There was no syrup water, but the refrigiration unit was hacked to make it much colder than the machines out in the street. Even visiting Microsoft which has commercial style refrigirators filled with free soda, juices and water did not impress me that much. Oh, and I also got to go up into the cabin of a huge crane (not at Microsoft of course).